I've been on a 'healthy eating' streak of late. That's not entirely true--I've been on a terrible butter laden eating streak for some time now. So now I'm attempting to practice moderation by eating healthier delicious fare 90% of the time, so I don't feel guilty with the occasional catered lunch, or dinner out on the town. This streak started the weekend of July 4th, (along with the Northeast's official start of bathing suit season - also known as my reality check) when, rather than do my usual baked-good pickup on the way to the Provincetown ferry, I instead packed two fruit and yogurt parfaits, with a perfectly pre-measured pouch of granola for the bf and I. It was delicious, and I was hooked. I was however, concerned about this pre-packaged granola. I didn't recognize some of the ingredients....and the ingredients that I did recognize certainly did not merit the $4.99 price tag for a measly bit of cereal-- unless there was some foie gras in there that I didn't notice, it seemed a tad overpriced. 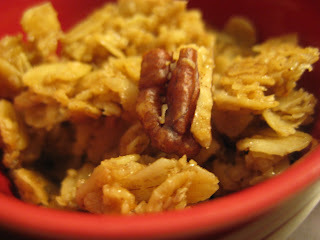 I began trolling the Internet in search of a granola recipe that suited my fancy...no raisins (I really don't like them in my cereal), maple flavor...I always have maple syrup on hand for sweetening baked goods and oatmeal. I finally came upon a perfect sounding recipe in the NYTimes. I was a bit skeptical, since the recipe relied on olive oil (rather than flavorless canola or safflower) and also called for some salt! Salt in my sweet granola goodness???? I love salty, lets be honest. So I gave it a go with things I had on hand. (I am on a budget after all - no need for fancy shopping trips). Instead of pistachios, I subbed the last of the pecans in my freezer. I didn't use pumpkin seeds, coconut, or apricots. I also left out the brown sugar, because I was all-out and I figured the maple syrup would be plenty sweet. I didn't have cardamom, but I did have pumpkin pie spice, which lists cardamom as one of the ingredients....into the bowl it went. The first batch was so addictive, that I couldn't stop eating it. I brought it in the next morning to co-workers....who demolished my first batch immediately. 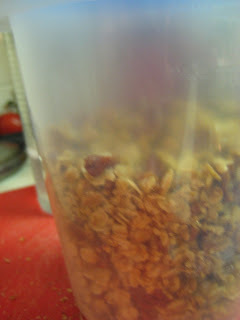 One coworker exclaimed that she had never heard of making granola. 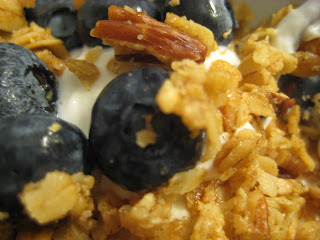 Yes, I make granola, and it is delicious. I have been making a batch a week to have on my morning fruit and yogurt. And although it is granola, and it is supposed to be healthy....and part of my new healthy eating regimen...this stuff is loaded with fat and sugar. I measure it judiciously. I have 1/4 cup each morning, and enjoy every bite. Maybe this is the moral of the story as well? Have your delicious calorie laden foods, but made with fresh ingredients. Enjoy a small portion and savor every morsel. It's VERY good. Watch it carefully - stir often. I think I just ate a burnt walnut. SO addictive though!! YUM! Sounds delicious! I wouldn't have thought to put in olive oil or salt either - interesting! I wouldn't have thought of it either! It was a very convenient recipe since I already had most of the ingredients! Of course, we'd be honored, thanks!! Oops, the above comment should've been under cheffresco, sorry about that! Michael was using my comp earlier. 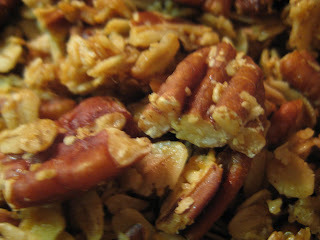 I'm looking for a new version of homemade granola since I make it every week for my family . . . homemade is way better than storebought! I'm going to try this olive oil salt one. Thanks for posting.